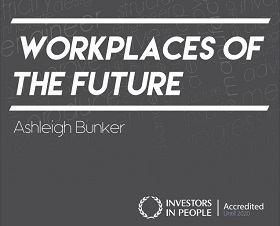 In May 2017, BSRIA launched Workplaces of the Future, written by workplace student Ashleigh Bunker. This insightful report contemplates the workplace needs and desires of the youth of today, aka millennials and Generation Z. The study was undertaken as part of BSRIA’s INSPIRE project, which works with local schools, national and local politicians and the media to promote and change perceptions about STEM (science, technology, engineering and mathematics). Generation X is defined as anyone between 1960 – 1980. Generation Y also known as millennials, are people born from 1980 – 2000. Generation Z is anyone born after the year 2000. The report considers how the advance of digital technologies is changing the way we work. Collaboration technologies are ushering in a next-generation workplace that is more productive, efficient and delivers meaningful cost savings to organisations of all sizes across the globe. The office of the future may not even need to be a workplace in the accepted sense of the word. With new and more advanced mobile devices giving employees the freedom to work from anywhere, these technologies will continue to reshape the look and feel of the ‘office’. What will be the expectations of the occupiers and what will be the impact for designers, developers and those managing the workplace environment? How the workplace environment will affect the career choices of different generations. How the needs of the different generations will need to be met in the transitioning years. The benefits of providing a new workplace environment that meets the expectations of the millennial generation and beyond. The history of office layouts; offices of today; the next 10 years and next steps. Technology has affected what millennials are like as employees. Generally, they want instant results making them more action orientated. Where the previous ideology was more 'eventually you get your dues', millennials want to work quickly and see results as equally as fast. This passion for instant results may make them seem impatient to older generations, but businesses will have to accommodate such characteristics. When generation Z walks into the office, they want to feel pride in their workplace not only for the design but also for the flexibility it will allow them. With the flexibility to work from anywhere, one will be working in a virtual world with colleagues in other countries and still be a in a functioning business. However, a problem on the horizon is that future offices could be too laid back. Millennials don’t want to work for just any company, they would prefer to earn less and work for a company with strong passions and morals. There is a desire to make the office look good. If the environment is not inspiring, the workers will not have pride in their workplace, nor will they feel inspired to work.